It's another one of those days, where I don't have much to say. It's hot and humid outside, so I'm tired and cranky. :P I'll let this pink speak for itself. Pink Voltage is a neon highlighter pink with a blue/violet shimmer. Bright, sunglasses needed, and in your face type of shade. I like it. Like most neons, this dries semi-matte. I'm thinking shades like this will look awesome underneath black crackle polishes! It's not the most original of colors, but it's nice. I've debated this color sooo much! I love how neon it leans but that flash of shimmer in it makes it so special! To buy or not to buy? I love this and your camera captured it so much better than mine. What settings was your camera on? I just picked this up from Ulta, like, twenty minutes ago! And another pink neon I need! Omg I love this color ! It's perfect for the summer ! 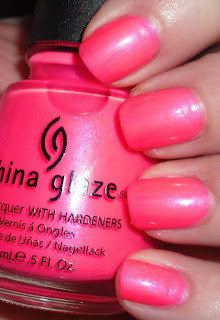 Very gorgeous neon pink! I'm hope you day gotten better since you post this .. I like it. It's not my all time favorite. I think there are better polishes out there, but it's not bad? Haha, I'm contradicting myself. I'd say if you're on the fence, I don't know if it's totally worth it unless it's on sale? I think my camera washed the color out a bit. I was using macro settings with auto flash. Cool, I hope you like it! Neon crackles would be great! Thanks! My day has been alright. It's not really bad nor good, just kinda...there? If that makes sense.